Gather your cookery group for a Thanksgiving hoedown! Thanksgiving the biggest festival in the American calendar, is characterised by a family feast. It’s the perfect excuse for a Bring-a-Bowl buffet, and bound to be one of the most delicious menus your Cookery group prepares all year. Thanksgiving is celebrated at the end of autumn, when the harvest has been gathered – so many of the traditional dishes are based around seasonal, local produce. This is a great menu to serve en masse, because the dishes are all designed to be cooked in large quantities. You could organise a fund-raising event at your local village hall, or a festive lunch at your office (asking non-cookers to donate for their meal). Allocate one dish to each member – perhaps by pulling papers from a hat – and give your Group licence to tinker with the traditional recipes. At the end, make sure everyone gets a copy of the recipes that were cooked, so that people can try out dishes at home. Thanksgiving is sometimes known in the States as Turkey Day. So the Main Event is, of course, a golden bird: cooking it is the challenge. And if you have vegetarians in your group, don’t throw them a dry old nut roast – bring out something rich enough to rival the meat. Roast Turkey. You may have been doing it for years, but why not make it different for Cookery Group? Try an alternative method – Nigella Lawson recommends brining the bird overnight in a cold water marinade flavoured with onion, cloves and bay. 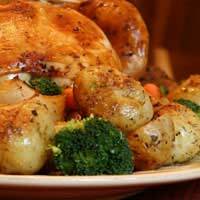 Annie Bell suggests roasting the bird upside-down, to give moist, tender breast meat. Stuff it the traditional way, or try an unusual pumpkin and sage stuffing. You could even go the Southern route with a cornbread-based stuffing. Mushroom & Chestnut Wellington. For vegetarians, a rich centrepiece is essential. The eminent food writer Rose Elliott suggests a Wellington made with a pate of mushrooms and chestnuts. Choose a good selection of mushrooms (including porcini) for the best flavour, then sauté in garlic and thyme, and blend with chopped chestnuts, one or two egg yolks, seasoning, and a splash of brandy. Mould this chunky pate into a large sausage-shape and wrap in puff pastry, slashing the top before baking. Your Thanksgiving table should be groaning with accompaniments. Be warned: your group will probably fight for the leftovers! Sweet Potato Bake. Because of their soft nature, sweet potatoes are best cooked in one of two ways – either baked in their jackets (delicious with a chive vinaigrette) or sliced and baked in a gratin dish. The latter is a traditional Thanksgiving method. Layer the sweet potato slices with sliced onion, rashers of bacon, herbs, or cheese (or use a combination), and bake in the oven until you can pierce with a knife. (Cover the dish with foil if it gets too brown before it softens.) If you’re daring, you could try making a sweet-toothed gratin by topping with a packed layer of miniature marshmallows! Roasted Vegetables. Instead of the ordinary roast potatoes, why not try roasting some new veg? Chop a butternut squash into chunky dice and toss in real butter; roast carrots and parsnips in honey and maple syrup; or prepare a tray of mixed roots (swede, potato, celeriac, and turnip) tossed in thyme and garlic. Cranberry Sauce. Try making a bright-coloured chutney with fresh berries and port, and complement it with a couple of other sauces – how about Cumberland and Bread Sauce? Brussels Sprouts. For a Thanksgiving twist, fry shredded sprouts until they start to become golden, then toss with bacon and serve hot. As an alternative, you could bring a traditional Green Bean Casserole – cook them gently in butter and toss with almonds, garlic and lemon juice before serving in a lidded dish.